Vancouver, B.C. - The Vancouver Giants announced Thursday that Michael Dyck (Lethbridge, AB) has been named the franchise's new Head Coach. Dyck was officially introduced as Giants Head Coach this morning at a media conference that took place at Pat Quinn's Restaurant at Tsawwassen Springs. 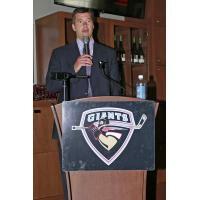 "I am very honored to once again join the Vancouver Giants organization," said Michael Dyck. "The Giants have always been a model franchise in the Western Hockey League and I am very excited to contribute to that legacy and lead this exciting group of players." Dyck, 49, is no stranger to the Vancouver Giants or the WHL. He spent three seasons with the G-Men as an assistant coach (2002-2005) and then spent three seasons with the Giants as a scout (2009), and their Director of Player Development (2010-2012). Dyck has 14 seasons worth of coaching experience in the WHL including a four-year stint (2006-2009) as Head Coach of the Lethbridge Hurricanes. During his tenure with the Hurricanes, Dyck led his team to a berth in the 2008 league finals and accumulated a record of 132-120-16. Dyck's WHL coaching resume also includes a season with Medicine Hat as an assistant coach, five seasons with the Hurricanes as an assistant coach and most recently in 2013-14 he joined the Kootenay Ice for one month when Head Coach Ryan McGill was coaching with Canada at the World Juniors. "We are very happy to welcome Michael and his family back to the Vancouver Giants," said Giants Majority Owner, President and Governor Ron Toigo. "Michael was somebody that we identified as a great fit early in our hiring process. He is held in high regard by former players and fellow colleagues within the hockey world." 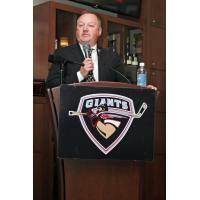 Giants General Manager Barclay Parneta adds, "Michael Dyck is the right man to lead us into this exciting chapter of Vancouver Giants hockey. His past success speaks for itself and when you combine his passion, work-ethic, and his ability to motivate and mentor today's young hockey player - He checks all of those boxes for us." Since 2010, Dyck has coached in various capacities in Lethbridge and has achieved remarkable success. Last season he guided the Lethbridge Hurricanes Midget AAA program to a league championship and a berth in the 2018 Telus Cup. A season earlier he helped the Lethbridge Hurricanes Minor Midget program to a league championship. In 2015-16 Dyck coached Bowen Byram and his Lethbridge Golden Hawks Bantam AAA team to a league championship. Dyck adds, "I am thankful to the Toigo family, the Giants ownership group, Barclay Parneta and the entire Giants organization for welcoming my family and I back to the Lower Mainland." Dyck will be joined in Vancouver by his wife Charlene. Together they have three children: A daughter Bailey, and two sons Carson and Brennan. Bailey is 19 and is attending film school in Vancouver. Carson is 17 and will be playing with the AJHL's Okotoks Oilers next season and Brennan is 10 and will be entering the fifth grade. The Vancouver Giants are thrilled to welcome Michael and his family to the organization.